Fried chicken is a Southern staple, and a delicious dish to boot - and gluten-free folks don't have to miss out on it. This hot chicken recipe is served with pickles and mayo, and the spice rub has a serious kick. 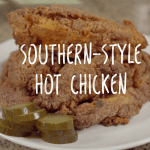 Try this Southern-Style Hot Chicken recipe from KC the G-Free Foodie – it’s gluten-free, dairy-free, and full of spicy deliciousness. The folks at Enjoy Life Foods asked me if I could come up with a recipe or two using their line of top-8 allergen free flour and mixes, and I was happy to oblige. They created the mixes because people with multiple allergies felt like they were missing out on so many of life’s great tastes, and I feel like no one should go without hot chicken -it’s one of my favorite things about the southern states. 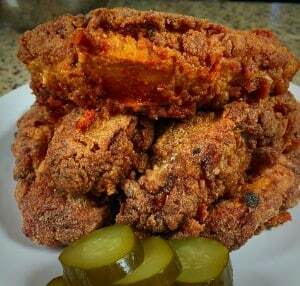 A hot chicken recipe is often served with pickles, mayonnaise and white bread for a sandwich with a spicy kick. Since that how the chicken is normally served, I used boneless breasts, but you could definitely use this recipe with bone-in chicken too, just make sure you fry long enough to get the chicken cooked! I used orange juice instead of buttermilk, which gives the same effect without the dairy. The red rub is seriously hot, but if you’re feeling really wild, you can make extra rub and coat the finished chicken with it – but don’t say I didn’t warn you! Combine the red rub ingredients in a large, shallow bowl. Add in the chicken and turn to fully coat. Cover the bowl and place in the refrigerator to marinate for at least 4 hours, overnight is better. When you’re ready to fry the chicken, mix the dredge, and pull each strip out of the marinade and coat them thoroughly with the flour mixture. Place the coated strips on a plate. Heat 1 inch of cooking oil in a large skillet over medium heat. Oil should be hot enough to sizzle and turn the strips golden brown without scorching them. Cook the strips a few at a time (don’t crowd the pan) for a about 3-4 minutes on each side, until the chicken is cooked through. Set cooked strips on a paper towel-lined plate to cool while the rest of the chicken is cooking. Season the finished strips with a sprinkle of salt and serve with your favorite hot sauce and pickles. This entry was posted in Dairy Free, Main Dishes, Recipes and tagged dairy free, dinner, food allergies, g-free, G-Free Foodie, gfdf, gluten free cooking, gluten free food. Bookmark the permalink.